Our new Vanda shares many of the traits of a celebrity. Effortlessly stylish, totally composed, it attracts interest and compliments with an almost gravitational force. Happily adapting to look marvellous in any room of your home, it has the true celebrity's talent of always being on tip-top form. Delicate and pretty, this stem of Fleurwood’s Natural Latex Orange Vanda Flower is detailed and beautifully realistic. It adds a wonderful touch of glamour. The real beauty of natural foam flowers is that they last forever; season to season in perfect bloom with no watering, pruning or wilting. At Giftlab we are passionate about imitating nature with absolute precision, and that's why we study real flowers and plants as a reference for each design. 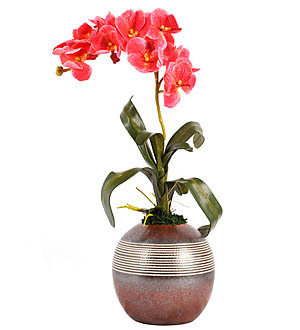 Flower Arrangement measures approximately 72cm in height with a diameter of 24cm.